WonderFox Soft, Inc. is going to wow you with this bounty offer for Christmas and new year. Trust me, this is a lovely way to celebrate 2015 and the new year 2016 already in view. 13 top-notched Microsoft windows software ranging from data recovery, PC tune up, system optimization, multimedia suite and productivity apps would be given to you at no commitment. You are required to do absolutely nothing to be eligible for this offer, all you need do is; hit the download button for your favorite software, install and activate with the free license code. The software chosen for this year’s giveaway are really top-notched and would be a lot to every PC user. Under-listed is the full list of software that can be download free until January 8, 2016. The giveaway is on and would run through January 8, 2016. 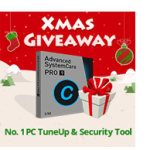 All you need do is visit the official giveaway page here and download the software of choice for free. About WonderFox: WonderFox Soft, Inc. is an award-winning software company specialized in multimedia software solutions including video, audio converting, and media editing programs.